With a new release of vSphere, many of us are excited about all the new features that we can see and touch. However, what you may or may not notice are some of the new features and enhancements that VMware Engineering has made to the underlying vSphere platform to continue making it better, faster and stronger. One such improvement is the introduction of a new Native Device Driver architecture in ESXi 5.5. Though this feature is primarily targeted at our hardware ecosystem partners, I know some of you have asked about this and I thought it might be useful to share some of the details. Note: If you are a hardware ecosystem partner and would like to learn more, please reach out to your VMware TAP account managers. If we take a look back at the early days of ESX, VMware made a decision to use Linux derived drivers to provide the widest variety of support for storage, network and other hardware devices for ESX. Since ESX and specifically the VMkernel is NOT Linux, to accomplish this we built a translation (shim) layer module called vmklinux which sits in between the VMkernel and drivers. This vmklinux module is what enables ESX to function with the linux derived drivers and provides an API which can speak directly to the VMkernel. So why the change in architecture? Since the stability, reliability and performance of these device drivers are importantly critical to ESX(i) second to the VMkernel itself. There is actually a variety of challenges with this architecture in addition to the overhead that is introduced with the translation layer. The vmklinux module must be tied to a specific Linux kernel version and the continued maintenance of vmklinux to provide backwards compatibility across both new and old drivers is quite challenging. 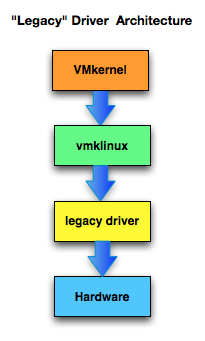 From a functionality perspective, we are also limited by the capabilities of the Linux drivers as they are not built specifically for the VMkernel and can not support features such as hot-plug/ To solve this problem, VMware developed a new Native Device Driver model interface that allows a driver to speak directly to the VMkernel and removing the need for the “legacy” vmklinux interface. What are some of the benefits of this new device driver model? This new architecture was developed with backwards compatibility in mind as we all know it is not possible for our entire hardware ecosystem to port their current drivers in one release. To that extent, ESXi 5.5 can run a hybrid of both “legacy” vmklinux drivers as well as the new Native Device Driver. Going forward, VMware will be primarily investing in the Native Device Driver architecture and encourage new device drivers to be developed using the new architecture. VMware also provides an NDDK (Native Driver Development Kit) to our ecosystem partners as well as a sample Native Device Driver which some of you may have seen in the release of vSphere 5.1 with a native vmxnet3 VMkenel module for nested ESXi. 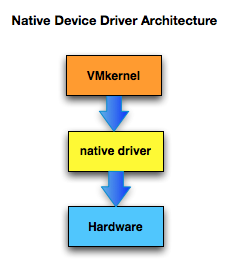 Hopefully this has given you a good overview of the new Native Device Driver architecture and in part 2 of the article I will go into a bit more details on where to find these drivers, which vendor supports this new architecture today and how they are loaded. Is VMware Virtual SAN a Native Device Driver too once installed into your ESXi host ? VSAN is not installed on an ESXi host, it IS already part of an ESXi 5.5 host as it’s built right into the VMkernel itself. Hello William, thank you for sharing the details. Look forward to Part2 of this article!